The maturity of Charles Victor Groves, third officer of the ss Californian, is called sharply into question by a recollection of his Captain, Stanley Lord. In the newly-released transcript of a recording session with Captain Lord in 1961, the maligned mariner is prompted by his interviewer (Leslie Harrison, General Secretary of the Mercantile Marine Services Association) to recall a story he had obviously previously recounted. The incident occurred on the morning of April 15, 1912, as the Californian was urgently responding to reports it had received since daylight of the Titanic sinking. Q570. Harrison: You told me that when you were coming down the [western] side of the ice [field], Groves was – joined you on the bridge, all hands had been turned out – and he had a comment to make on the disaster. I wonder if you remember anything he said to you at the time? Q571. Something about Lloyd’s, was it? Q572. That was his only comment you remember? The reported heartless remark would depict 24-year-old Groves to be a callow, shallow youth – although the British Titanic inquiry would subsequently come to rely upon him for its preferred version of events. Captain Lord had nothing against Groves, who was qualified as an officer. Q138. What’s your attitude towards Gill and Groves, both of whom gave evidence which really – ? Groves went to the Boston Herald – but on the following voyage, said Captain Lord. In the meantime Groves had claimed in Britain for the first time that he thought he had seen the Titanic. He also thought – and wrote in a poorly-composed and ungrammatical 1957 manuscript that he thought on this morning that he had seen Titanic survivors on icefloes. He claims Captain Lord used binoculars and reported that the ‘figures’ were merely seals. No other crew member reports this incident. Groves’ timings for the events of the ‘morning after the night before’ meanwhile clash with all of his shipmates, and with Captain Rostron of the Carpathia. 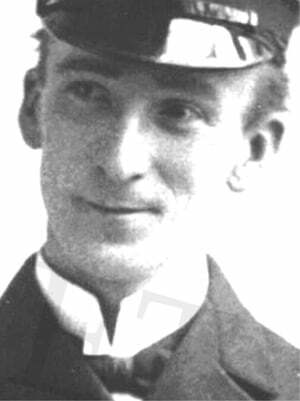 The young officer also claimed in his manuscript that he had the Californian’s wireless phones on his head at a time when the Titanic was sending out distress messages. He did not notice the apparatus was not working, and listened to silence. But he believes he was competent in Morse code and could not have missed alerting everyone aboard his own vessel if he messages had come through. 8283 Did you take his [the wireless operator’s] instruments and put them to your ears? — Yes. 8285 Did you hear anything? — Nothing at all. 8286 How long did you listen? — I do not suppose it would be more than 15 seconds at the outside — well, 15 to 30 seconds, I did it almost mechanically. Half a minute is a very long time to be listening to silent earphones. Not even a tiny hiss, which would be familiar to anyone who claims to be au fait with wireless. 9044. — I do not remember Mr Groves picking the ‘phones up, but Mr Groves says so. Which is a very careful answer… if it does not outright mean that Groves is probably lying, it does not amount to any sort of corroboration that he is telling the truth. There is ample evidence that Charles Victor Groves is a Walter Mitty. His inquiry evidence is littered with contradictions and impossibilities. Yet his evidence was preferred to that of his seniors. ‘I was rather sore about it, I must admit,’ says Lord at Q342 in the recordings transcript. ‘Why should a junior officer’s evidence be taken in preference to two senior officers, three senior officers – myself, the chief officer and the second officer? And at Q419. Can you describe the personal appearance of, say, Groves, in those days? Q420. But at the time he was an ordinary - ? The Titanic disaster itself got a lot of publicity. No doubt it did shock the underwriters at Lloyd’s. But it was nothing for Charles Victor Groves to smirk and preen about.